This Artisan fund is managed by David Samra and Daniel J. O'Keefe. Samra has been managing this fund since September 2002. Samra is the lead portfolio manager for Artisan International Value Fund. O'Keefe is the portfolio manager for Artisan International Value Fund. This fund’s dividend yield is 0.06%. Typically, this yield is distributed annually. The annual expense ratio of this top foreign large blend fund is 1.18%. The fund’s total net assets are $4.5 Billion. To buy this foreign large blend fund, investor can start with $1,000 initial investment for regular brokerage account. Subsequent investment can be done with $50 or more increment. For tax deferred accounts (traditional IRA, ROTH IRA, 401k, 403b), please check with your own brokerage. There are 83 brokerages that offer this best fund. Several well-known brokerages are Pershing FundCenter, TD Ameritrade, DataLynx, Schwab, DWS Retirement Sevs Investment Offerings, etc. This top rated stock fund employs 4 key investment styles: pick undervalued companies, choose higher business quality companies, invest in strong balance sheet companies (i.e. they have financial strength), and identify companies with shareholder oriented management. Investment risks include stock market risk, foreign investing risk, small and medium-sized company risk, value investing style risk, management risk, etc. As of January 2012, the top 8 country allocations are: United Kingdom (26.5%), United States (18.6%), Japan (13.3%), Switzerland (11.7%), France (10.1%), Netherlands (7%), Ireland (4.1%), and Germany (2.9%). The top 5 sectors include Consumer Discretionary, Financials, Industrials, Consumer Staples, and Health Care. 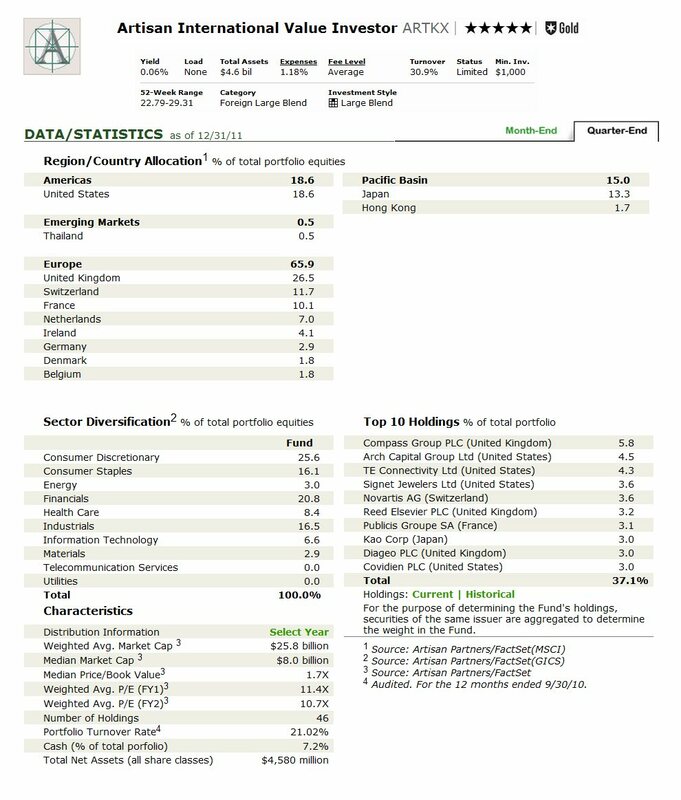 The top 10 stock holdings are: Compass Group PLC (United Kingdom), Arch Capital Group Ltd (United States), TE Connectivity Ltd (United States), Signet Jewelers Ltd (United States), Novartis AG (Switzerland), Reed Elsevier PLC (United Kingdom), Publicis Groupe SA (France), Kao Corp (Japan), Diageo PLC (United Kingdom), and Covidien PLC (United States). Note: This fund maybe close to new investor, please checks with your brokerage for details.